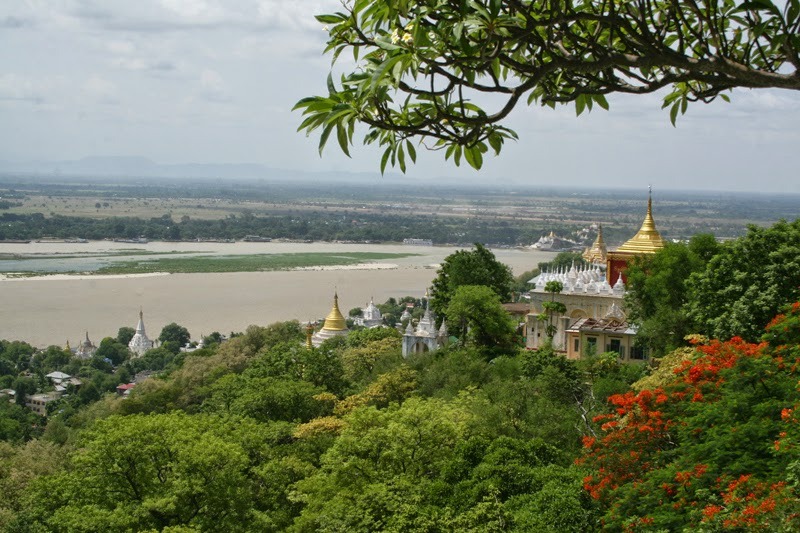 Once, very briefly, capital of Burma, Sagaing is on the other side of the wide Ayeyarwady river from Mandalay, perhaps a dozen kilometers from the city centre. 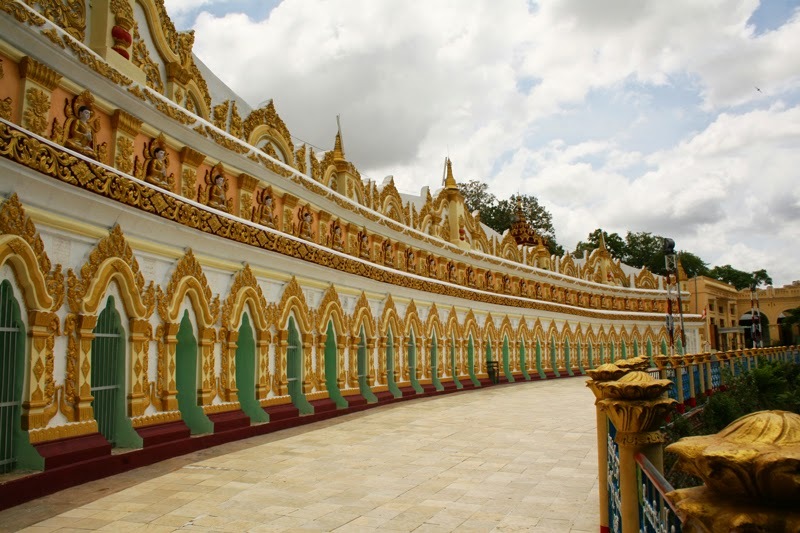 It makes a nice day trip from the city, combined with one or two other sites, like Inwa or Amarapura. Mmm... climby. 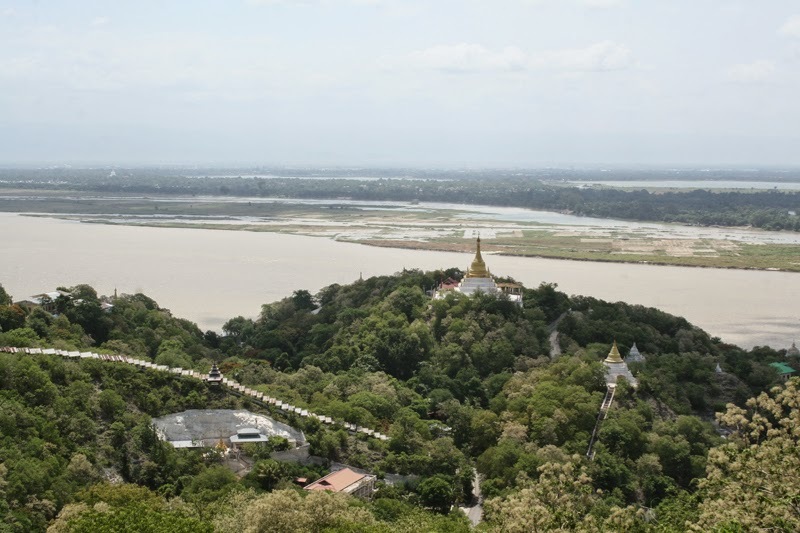 Some of the hills and stupas of Sagaing, with Mandalay visible in the distant upper left. The handful of hilltops are covered in stupas, shrines, and temples. Walkways and endless steps connect them all. You can, if you have a few hours, explore the site on foot. Or you can pay a dollar or two for one of the local motorbike drivers to take you up and back, including a couple of stops at various temples, which will invariably include Soon U Ponya Shin Paya, the best known (and most popular with local devotees) temple. The motorbike taxi drivers hang out underneath the trees a little way down the main road from the entrance to the hill. Umin Thounzeh (30 caves), a beautiful complex a few minutes downhill from Soon U Ponya Shin Paya. 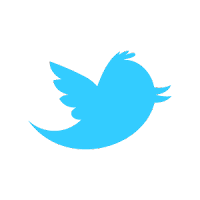 You can visit the site in an hour or less, but if possible, I'd recommend giving yourself more time. The scenery is lovely, lush, green and frequently floral. You could spend hours exploring the steps up and down the hills, stumbling across quiet temples and preying monks, or you could park yourself on the wide terrace at the back of Soon U Ponya Shin Paya and just enjoy the view (according to LP, there'sa snack bar here sometimes, but there was no sign of it when I visited, which was a shame because it would have been a perfect place for a tea break). There are, however, some souvenir shops outside the temple where you can get cold drinks. View from Soon U Ponya Shin Paya's terrace. Anyone for tea? According to the Lonely Planet, there's a $3 ticket required to visit the site. But in off season, no one makes any attempt to collect it.